The next GoLP VIP Seminar will be given by Prof. Luís Melo, from IST (Physics Department) and INESC-MN, on September 24, 4pm in Anfiteatro Abreu Faro (Complexo Interdisciplinar). 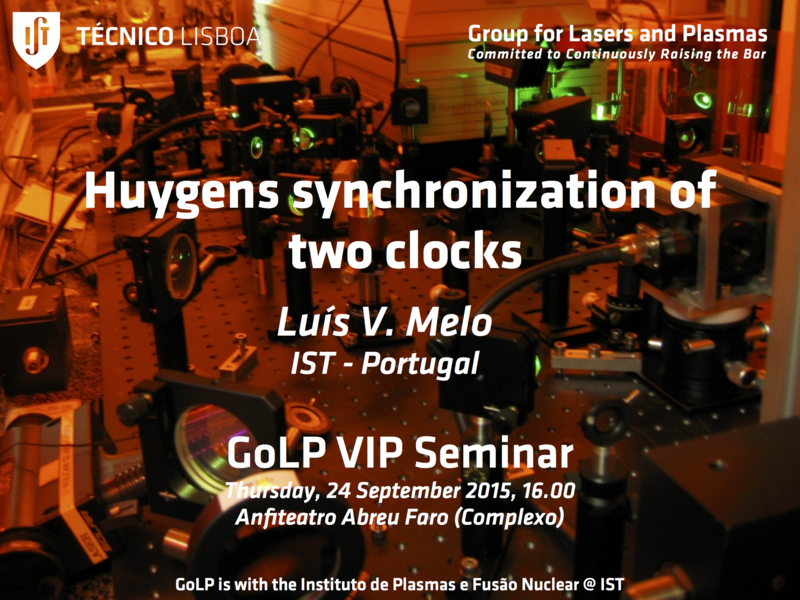 The seminar will feature Luís Melo’s recent work on the Huygens synchronization of two clocks. The synchronization of two pendulum clocks hanging from a wall was first observed by Huygens during the XVII century. This type of synchronization is observed in other areas, and is fundamentally different from the problem of two clocks hanging from a moveable base. We have developed a model explaining the phase opposition synchronization of two pendulum clocks in those conditions. The model is based on a small amount of energy being sent by each clock to the other at a certain point of the limit cycle. The predicted behavior was observed experimentally on clocks hanging from a good sound conductor.